Please visit our new website for further information. You would need to have your head buried deep in the sand not to realise that the world of work is changing rapidly. The business environment is constantly being reshaped and redefined by new technology and innovation (digital, artificial intelligence, big data, internet of things), macroeconomic trends (globalisation, economic uncertainty, political shifts), disruptive business models (Uber, Airbnb) and strategies (agile, sprint). Collectively and individually these factors are having a huge impact on the tasks that people do, how they do it and where they do it. For example a recent McKinsey study revealed that 20 to 30 percent of the working-age population in the United States and the EU15 countries engage in independent work. ‘Jobs’ are being redefined in a multitude of different ways and we are now truly entering the age of the ‘Knowledge Economy’ where resourcing decisions around an organisation’s “talent” – their intellectual capital, expertise, specialised skillsets – are critical drivers of a firm’s value, success, innovation, competitiveness and growth. But how can organisations ensure they access the right talent with the required skills at the right time? This is a conundrum for many of our clients and given the number of variables at play, it is not an easy one to overcome. To help us understand the options in more detail we recently spoke with Paul Vincent, Head of Global Talent Supply Chain Strategy at KellyOCG. “When an organisation develops its business strategy there are always corresponding resourcing implications” Paul explained. “These require three types of decisions; 1. what skills and expertise they need to hire into their permanent workforce, 2. what internal capability they need to train and develop and 3. what skills and expertise they need to engage on an ‘on demand’ basis. We would agree. 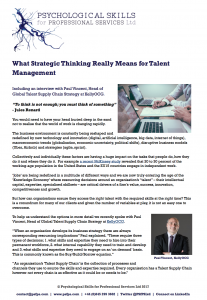 Having identified the importance of talent management to a firm’s overall success, one might expect resourcing decisions to be a direct result of reliable and valid strategic analysis; driven by the firm’s overarching corporate objectives. This work undertaken by internal teams which are collaborating effectively and are equipped with the knowledge and analytical skills to generate insight and produce clear resourcing recommendations for decision makers and stakeholders. Unfortunately, within many organisations this is not the case. Resourcing decisions are frequently reactive, short term and budget driven. “Improving internal collaboration is probably the biggest opportunity for improvement,” Vincent told us. 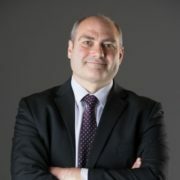 “It is still the case in many organisations that the central focus of HR is on the “permanent” workforce whilst Procurement focus on the “contingent” workforce. This leaves operating managers (i.e. the people who consume the skills and expertise) forced to straddle two competing schools of thought. The classic HR mindset being to attract, engage, develop and retain employees (with the associated financial investment required); the classic Procurement mindset being to meet on demand resourcing needs at minimal cost and risk. “Strategic workforce planning is becoming far more important”, Vincent added. “Organisations often invest great time, effort, and money in developing products and services, but few take the same care with their workforce resources. Although human capital accounts for the majority of all operating expenses in most enterprises, too many still apply the same demographic and psychographic HR processes to every role and worker, without differentiation. This one-size-fits-all approach is no longer enough to maintain a competitive advantage. In this environment, the type of contextual analysis that we encourage and educate our clients to deploy can work very effectively – resulting in an integrated diagnosis of resourcing needs across the business, which is fully aligned to the business strategy. A fully aligned diagnosis means resourcing options can be considered holistically and implemented to the satisfaction of all parties; HR, procurement and end user. An external party undertakes the analysis for the organisation and recommends the best ‘Buy/Build/Borrow’ mix. Positives: This work will often be of a very high standard and the consulting firm will have the necessary analytical skills to undertake the strategic analysis. There is also less likely to be a bias towards a pre-determined recommendation. Challenges: Can be a costlier option. The analysis will also be a ‘snapshot’ in time rather than a ‘real time’ analysis. The external consultant is also unlikely to have a better understanding of the client’s context and objectives than the client. The consultant also needs to have a very good appreciation of the potential solutions too. Positives: The client ‘owns’ the analysis and can undertake the analysis in real time. The client should have a clearer understanding of their overall objectives and context than an external party could ever attain and so outline more specific resourcing solutions. This can also be a cheaper option in the long run. Challenges: Organisations must invest in the structured analytical thinking skills (or consulting skills) needed to undertake the exercise. These skills are unlikely to be present already. Likewise, if the analysis is to be valid and reliable, then the analytical process must be adopted firm-wide – firms will need to address any demarcation between HR and Procurement/Finance functions to achieve this ambition. Key Point: By undertaking the analysis themselves, firms must ensure their resourcing decisions are not subject to confirmation bias. 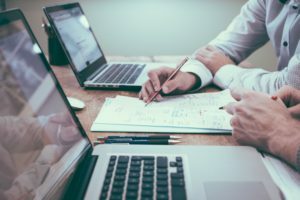 Decisions should be based on an understanding of the organisation’s overall objectives, rather than simply financial considerations, in the case of the finance department. Positives: A truly holistic approach to resourcing decisions with both parties adopting the same structured analytical thinking process. By working together, the organisation brings a detailed understanding of their own context and strategic objectives and the resourcing firm brings their talent supply chain expertise and can customise a solution unique for the organisation. By working together, there is a clear line of sight between diagnosis of the ‘talent’ situation and potential resourcing solutions. Key Point: The entire analysis is validated by the resourcing firm, removing any confirmation bias which the organisation might adopt. Similarly, the resourcing firm produce tailored solutions that match the client’s situation rather than off the shelf products. The world of work is changing and resourcing decisions are becoming ever more critical to organisational success. This new criticality calls for a step change in attitudes and strategies towards workforce planning. Quite simply organisations who adopt a long-term, proactive contextual approach to resourcing decisions will stand the best chance. Our strategic analytical thinking programme enables those responsible for talent management to increase the power and effectiveness of their thinking and apply a consistent consultative approach to strategic workforce planning. Great insight into the evolution and mindset needed by the HR function to succeed moving forward. Many thanks for your thoughts Jennifer. Glad you found the article of value. Excellent Interview Paul and such a clear message to which more firms should sit up and consider. Thanks for commenting Anna. We agree it’s a great quote from Paul. "Thanks to the techniques we learnt on the analytical problem solving programme we achieved board sign-off and delighted the client." "In our course everyone was so engaged and enthusiastic that we happily ran 1-1 1⁄2 hours over time each day!" "PSfPS provided consistent training for all our partners across Europe – 120 partners in the past 3 years on leadership behaviour and becoming a 'thinking partner' for our clients"
"The tools and techniques will not only improve the quality of our work, but also reduce effort and institutionalise re-use. I now truly feel part of a fully integrated, high-performance team"